Established in 1988, The Weatherhead 100 award was created to celebrate Northeast Ohio’s spirit of entrepreneurship and to recognize companies that exemplify innovative success in the region. The annual award recognizes the region's fastest growing companies based on revenue generated within the past five years. This year, Universal Windows Direct clocked-in at number 43 on the Weatherhead 100 list and was recognized for the company's astounding growth of 171.56%. "It is truly an honor to win such an award, not just once, but twice", said Michael Strmac, Co-Founder and CFO. "Our tireless employees are what made this possible; they truly are like family". 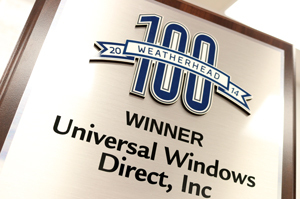 Universal Windows Direct is no stranger to the Weatherhead 100 list, as they were also named to the list in 2011. That year, they were recognized for their 199.58% growth, finishing in the number 21 spot on the list. "I have to agree with Mike, this could not have happened without everyone working hard and doing their jobs day-in, day-out. Mike and I are so thankful for our employees", said William Barr III, CEO and Co-Founder. "The secret to success is a great product, a great group of employees that believe in what you're doing and having fun while you're doing it; that's what got us to where we are today". Everyone at Universal Windows Direct is excited about receiving the award and cannot wait to see what the future holds for the company. Interested in joining the Universal Windows Direct team? Look here for a list of open positions.